Nowadays, it is possible to "report" and share information from almost anywhere in the world. This is regularly done before professional journalists arrive at the scene of an event (e.g. a political demonstration or a natural disaster). As a consequence, journalists increasingly turn to Social Media to find both news and background information. Verifying content in easy, transparent and relatively fast ways is becoming more and more relevant, especially when taking into consideration (a) the sheer quantity of content found in Social Networks, and (b) the fact that a lot of content consists of hoaxes, rumours or deliberately misleading information (e.g. propaganda, spin). The REVEAL project focused on verification technologies, tools and strategies. It developed tools, components and strategies that aid journalists in identifying, assessing and verifying user-generated content (UGC) on Social Networks. Journalism: The challenge for journalists and independent media is to report on developments and occurrences across entire countries and analyze the situation. Often it is difficult to separate truth from lies, propaganda from facts. Especially without or limited direct access to the region, journalists have to rely on other accessible sources, with much content coming from Social Media. Enterprise: Software forums are the main place for end users, experts, developers, students, scientists to share their knowledge and get useful information from others. Metrics such as community members’ replies, ratings and comments can be utilised to measure modalities such contributor reputation, history, popularity or influence. Geoparsing, Geosemantics, Trust and Credibility Modelling - Highly scalable real-time geoparsing of regions, streets and buildings running on an Apache Storm cluster. Natural language processing to extract claims (e.g. fake or genuine images), source attribution (e.g. via BBC News) and geosemantic context useful for cross-checking facts. Knowledge-based trust and credibility model to cross-check evidence with known facts about an event for semi-automated verification. Decision Support System and Visualization - Situation assessment framework for aggregating and visualizing large volumes of social media content. 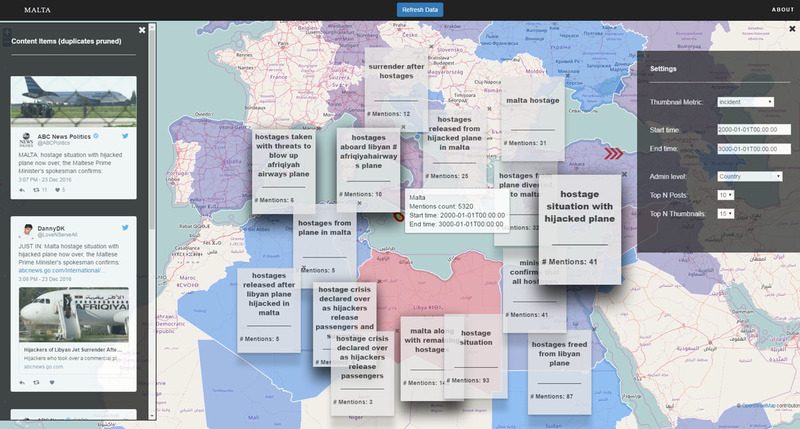 Multi-dimensional interactive visualizations allowing data to be clustered and sub-clusters so analysts can quickly get to evidence relevant to verification of breaking news. Social media crawling - Social media crawler platform (Twitter, You Tube, Instagram, Facebook etc.) able to run 24/7 on many parallel news stories. Journalist Decision Support System - JDSS. Scalable Python Geoparse Library Released - geoparsepy. Bias in Linked Open Data - BLinD. The REVEAL project was a 38 month project funded by the EC FP7 framework programme. REVEAL has received EC research funding.